JE Pistons stocks thousands of pistons in what is called the shelf stock program; each of which has been built for a high-volume application, such as those pistons built for a traditional small-block Chevrolet engines. Many of the applications where shelf-stock pistons are traditionally used can actually share the same forgings, as the bore dimensions across some of these applications are very similar, as are the build requirements of the piston when it is complete. Many times, a simple $5 change can help get you what you need. Click here to learn more about $5 changes. But when you’re building an engine that’s slightly off the beaten path, a custom piston is just what the doctor ordered. 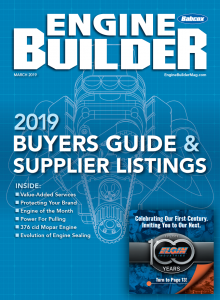 A custom piston order form is required for custom pistons but if there’s a reference engine application, you don’t have to fill out every line. 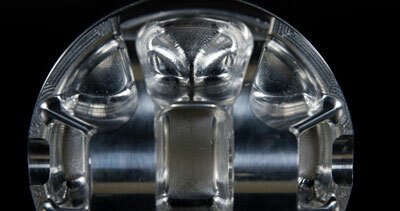 JE offers full under-crown milling to remove as much weight from pistons as possible. Forged? Or Billet? Which Is Best For Me? 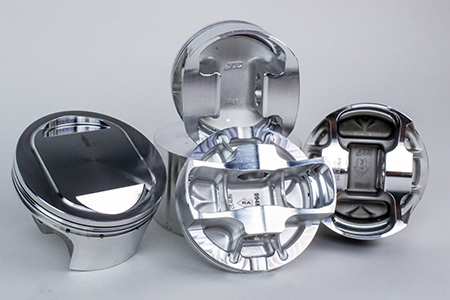 Over the last 70-plus years, the JE Pistons design team has seen just about any engine combination which can be dreamed up and can likely support your engine build with a piston forging to satisfy the parameters required. A forged piston begins with a mechanical process which requires many hundreds of tons of pressure, whereupon a piston blank – which is shaped somewhat like a hockey puck – is preheated, then smashed into a rough shape which, then cooled and set aside until it is needed for a customer (unless it is a shelf stock part number). There are many steps to the machining process, but a quick rundown has piston blank going through the forging process, then to heat-treating, then into the end-to-end machining following a trail where several steps all come together to produce a ready-to-run, fully CNC-machined piston at the end of the line. 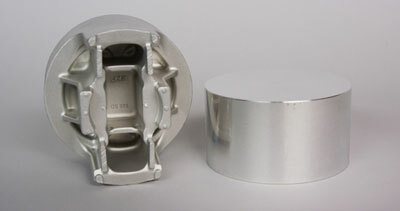 Custom pistons are machined from our wide selection of forgings. However, if a suitable forging is not available, a forged billet can be utilized. However, there are instances where there is not a piston forging available to work with a particular engine combination, and that’s where billet pistons come into the picture. For instance, when a race team is working with an engine program that has been specifically tailored to their needs, a billet piston may make the most sense for that particular usage scenario. Many of those teams are constantly refining their engine programs and testing various configurations to develop the most efficient burn cycle and flame front. 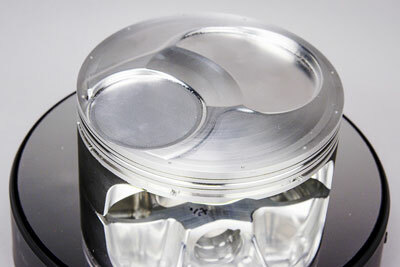 Want to learn more about piston technology? Head over to the JE Blog! “The main advantages to choosing a billet over a forging are: first, you don’t need to have a large quantity of parts to justify the cost of making a new forging die and second, any changes to the billet design can be made quickly compared to making a new forging die. No one would consider spending the thousands of dollars required to make a forging die to only make a few pistons. The billet process also allows us to test out potential forging designs before spending the money for a new forging die. Using billets, we can manufacture the pistons and test them out in real world conditions before committing to the cost of making the new forging die,” says Eugene Henson, JE Pistons’ Manufacturing Engineering Manager. Bead blasting of the underside of billet pistons can help to remove sharp edges which can become stress risers. 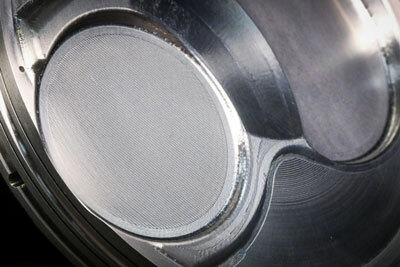 In terms of construction, a billet piston starts out as a heat-treated puck, similar in shape to a hockey puck. But unlike a forging, all of the material in a billet piston that doesn’t end up as part of the finished billet must be removed from the puck. This requires a bit more engineering time to design the billet properly, and time from the CNC programming team to create accurate toolpaths to machine the puck into its final configuration. 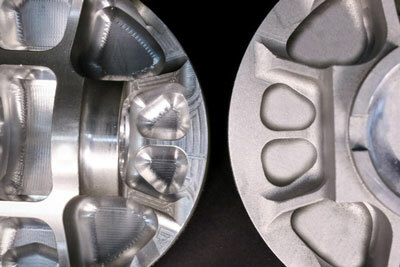 JE’s advanced CNC machines and cylinder head scanning capabilities allow them to create precise, 3D piston domes. “If you are developing a racing program you can make slight changes to the strut angles, valve pocket locations, and virtually any part of the structure as you see fit. When working with a forging you are constrained to what the forging you start with can handle. If your engine needs a strut with a more diverging angle than the forging supports, the billet can be just quickly designed to accommodate,” says JE’s Global Automotive Product Manager, Nickolaus DiBlasi. This piston has been treated to gas porting, 3D crown design, and has also had precision “ultra-groove” ring lands machined.